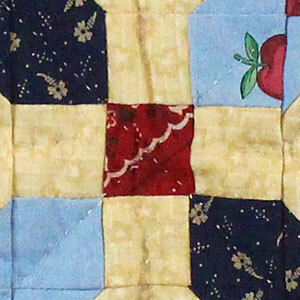 This Amish Country Hanky Panky Pattern Wall Hanging is a fun and colorful way to bring joy and delight to your home. Handquilted with approximately 7 stitches per inch, this wall hanging is from central Pennsylvania, and the simplicity and ease of an Amish farm life is reflected in the patchwork fabrics. This Amish quilted Wall Hanging measures approx. 21" x 20". There is a sleeve on the back for easy hanging.